April 24, 2017, 7:01 p.m.
By Laura Hazard Owen @laurahazardowen April 24, 2017, 7:01 p.m. So what would happen if you combined professional journalism with fact checking by the people? On Monday evening, Wikipedia founder Jimmy Wales launched Wikitribune, an independent site (not affiliated with Wikipedia or the Wikimedia Foundation) “that brings journalists and a community of volunteers together” in a combination that Wales hopes will combat fake news online — initially in English, then in other languages. 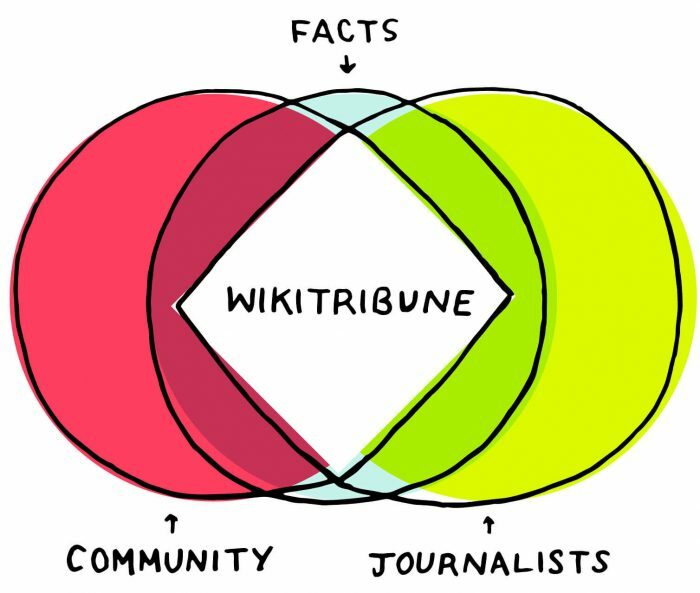 The site is launching with a crowdfunding campaign to fund the first Wikitribune journalists (the default amount is $10 a month, but users can donate any amount they wish) “with the first issue of Wikitribune following shortly.” The Wikitribune page said that the goal is to hire 10 journalists. Technology platforms can choose to expose more information about the content people are seeing, and why they’re seeing it. We need this visibility because it sheds light on the process and origins of information and creates a structure for accountability. We need online spaces for open dialogue across a variety of viewpoints. These spaces must be inclusive by design — toxic behavior, including harassment, is unfortunately a fact of the internet. We need ground rules, commitment to verification, civil dialogue and active participation. And we need to apply these principles to all our online activity. The rise of the internet may have created our current predicament, but the people who populate the internet can help us get out of it. Crowdsourced news investigations aren’t new, but they’ve mostly been done on a by-story basis. The Guardian did it with an investigation into Parliament’s expenses. Medium’s Ghost Boat was another attempt. And there is also Wikinews, the Wikimedia Foundation’s 13-year-old attempt at crowdsourced current news. That site has not achieved its stated mission of becoming an AP-like, “high quality feed of news free of charge“; on Monday, its top article was a short, three-day-old one about UK Prime Minister Theresa May’s call for a June general election. But Andrew Lih, an associate professor at American University and the author of The Wikipedia Revolution, thinks that Wikitribune has a lot more potential, precisely because of its layer of professional journalists. POSTED April 24, 2017, 7:01 p.m.
Owen, Laura Hazard. "Wikipedia founder Jimmy Wales launches Wikitribune, a large-scale attempt to combat fake news." Nieman Journalism Lab. Nieman Foundation for Journalism at Harvard, 24 Apr. 2017. Web. 18 Apr. 2019. Owen, Laura Hazard. "Wikipedia founder Jimmy Wales launches Wikitribune, a large-scale attempt to combat fake news." Nieman Journalism Lab. Last modified April 24, 2017. Accessed April 18, 2019. https://www.niemanlab.org/2017/04/wikipedia-founder-jimmy-wales-launches-wikitribune-news-by-the-people-and-for-the-people/.